“For I know the plans I have for you, declares the Lord…” (Jeremiah 29:11). This is the truth we clung to as doctors spat out words like “blind,” “disabled,” “malignant tumors,” and “developmental delay.” Our first child had been perfectly healthy and easy, but our newest baby girl had not been a normal newborn. She never made eye contact. She couldn’t find her toes or hands. She was nearly inconsolable night and day. Finally, we took her to the pediatrician and asked, “Will you please take a closer look at her eyes?” We were immediately sent to a children’s opthamologist. Only a day after receiving the diagnosis of aniridia, God assured me He had big plans for our precious girl. He would be bigger than the diagnosis and use her in mighty ways. The devastation was no less, but the peace of His promises held us together. 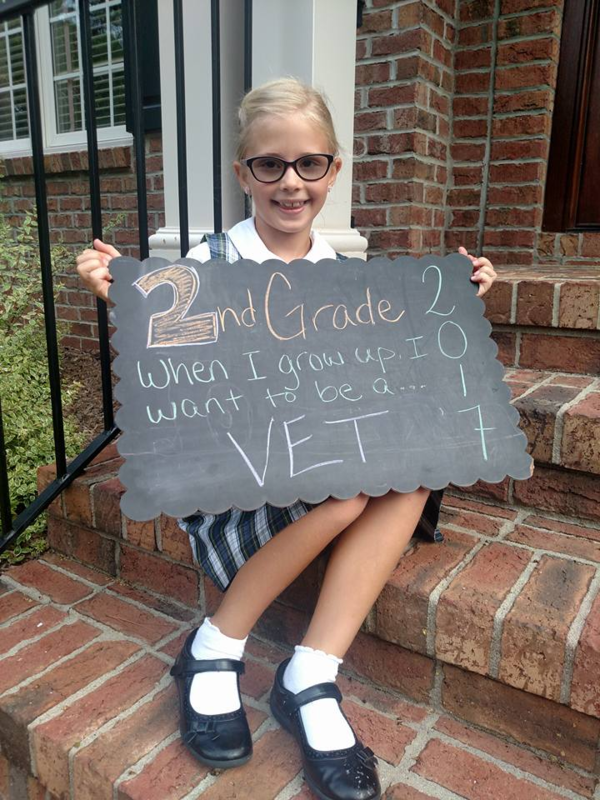 Logan Jo is a third-grader in Mrs. Covil’s class, in her second year at Cary Christian School. Her sisters, Mallory and Bentley, also attend CCS; little brother Corban will begin preschool in September. The move to North Carolina from Colorado just over a year ago was the uprooting of all we knew was safe and secure for our kids, especially Logan. Providing a steady, calm, and fully-engaged team around her has proved to be essential. We are dealing with a diagnosis so rare that even the specialists in vision have limited knowledge about what to expect and how to treat her complicated disease. Thank goodness for my nursing background, which gives credibility to my intensive research and newly acquired knowledge of aniridia as I advocate for Logan with her doctors. In Colorado, the kids were in a charter school where Logan had developed from preschool 3 into first grade. The team there taught her to read, provided visual aids such as CCTVs, tablets, magnifiers, a vision teacher, and several accommodations. She was on an IEP (Individual Education Plan), and we could not have felt better about her care in the school setting. When we learned we would be moving to Cary for Patrick’s job, we were concerned about finding a school environment that could meet the needs of all our children, especially Logan. We felt strongly that our children be in a school that would provide Christ-like guidance, but worried that a private school would not be able to provide the same tools for Logan as her prior school. I toured CCS on April 20, 2017, and knew it would be the new school for our kids. Patrick and I left it up to God to provide what Logan might need. At the time, Mr. Seitz, dean of the lower school, was also newly living in North Carolina. He was more than willing to meet with us to discuss Logan and her needs. It turns out, as usual, that God knew better than we did about how well Logan would thrive in this new school setting. Not once has she required a CCTV or handheld visual aid. The school provided a large print Bible and enlarged math worksheets, and has given Logan the freedom to move about the classroom as she needs to be able to see what the teachers are presenting on the boards. They used colors on the whiteboard they knew Logan could easily see, avoiding yellows, pinks, and reds. The classical learning style has provided so much freedom for Logan Jo and her vision, and really supports the idea of “no child left behind.” She is able to move and memorize and learn using senses other than vision. The strain on her eyes is lessened because of the approach to teaching through developmentally appropriate practices. I recall a moment early in the first year at CCS, when I sat in the gym to see Logan’s second grade class perform. I knew Logan could not tell me from other parents in a crowd, so I told her I would be sitting in the middle in the second row. I wore a bright green dress to help stand out from the other family members. As Logan and her classmates lined up on the risers, Logan was looking all around. I was standing waving my arms while tears welled up in my eyes as I was thinking, “My baby can’t see me here, excited to watch her perform.” Just a moment later, a sweet friend in Logan’s class tapped on her shoulder and pointed over to me. I could see her friend mouth the words, “Logan, your mom is right there.” The tears poured down my cheeks as I realized…this Christ-like community of teachers and staff we have put around our children is putting the love of Jesus in to practice. The example of it is trickling down through generations. So often in life we find ourselves to be a part of a club we never chose to join. For us, “Parents of a Special Needs Child” is one of our clubs. To go from using several visual aids to only enlarged print and minor accommodations is amazing for our Logan, who is being given the chance to be just like the other kids around her….a God-given gift to be nourished for His grand purposes. There is no doubt in our minds that He will use her in incredible ways, and CCS is just the place to develop her heart for this purpose. You might never know which one of the beautiful children down the third grade hall is Logan Jo Johnson, because instead of being known as the girl with a vision disorder, she is known as the sweet girl with a big smile who can light up any classroom.